Successfully Added 3G Android Tablet - Android OS, Bluetooth 4.0, Dual-IMEI, OTG, 3G, Quad-Core CPU, 2GB RAM, 7-Inch FHD Display, 2MP Camera to your Shopping Cart. This cheap tablet PC is so much more than your regular Android tablet. 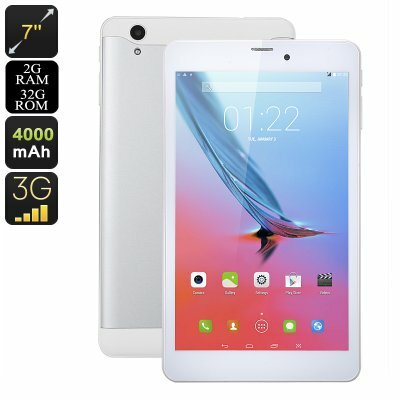 By supporting Dual-IMEI numbers, this 7-Inch tablet allows you to slide in two SIM cards to enjoy ultimate connectivity. Not only does this provide you with the possibility to make calls and send text messages with your tablet PC, it also allows you to use 3G. Thanks to this, you’ll be able to stay connected to the web at any time. Whether you’re at home, the office, or enjoying the outdoors – this 3G tablet makes sure you’ll stay connected. Along with its Android operating system, you can be guaranteed to enjoy a smooth user experience at any time. On the 7-Inch display of this Android tablet, you’ll be able to watch movies and play games in crisp FHD resolution. Coming with a sophisticated Quad-Core processor and 2GB RAM, the 3G tablet is capable of tackling all basic Android features out there. You’ll have access to 32GB ROM and the possibility to slide in a 64GB SD card. Therefore, you won’t have to worry anytime soon about running out of storage for your favorite files and media. Whether it’s games, movies, or Apps – this Android tablet supports it all. This 3G Android Tablet comes with a 12 months warranty, brought to you by the leader in electronic devices as well as wholesale tablet PCs.. Lack of detailed instructions for people new to the Android system.